Ordering the house beer at an Earls restaurant just became a human rights issue. The popular restaurant chain, with outlets across Western Canada and Ontario, is the target of a complaint over the name of its brew: Albino Rhino. Ikponwosa (I.K.) Ero of Vancouver has alleged to the B.C. Human Rights Tribunal that the name singles out people like her who suffer from albinism, the absence of pigment from the skin, hair and eyes. In her complaint - which also takes aim at Earls' Albino Wings Wednesdays - Eros alleges the name demeans her and other albinos by deliberately evoking a sense of oddness about the condition, CBC News reports. It's a medical condition, not a taste treat, Ero argues. "You go into a restaurant and someone says, 'Can I get a palsy? Give me a palsy,'" she said. "And what it stands for is a cerebral palsy cocktail. I don't think that would fly well at all with anybody with cerebral palsy, or their families, who have to live with the condition. "So how does it work, in [the case of albinism] that you can market food with a medical condition?" The U.S. National Library of Medicine defines albinism as a genetic defect of melanin production that leaves those who have it with little or no colour in the skin, hair and eyes. Ero, who was born in Nigeria, said in her complaint that in Africa ablinos are often targeted for ritualistic murder, according to CBC News. The threat of persecution was one of the reasons she and her family fled to Canada when she was a teenager. 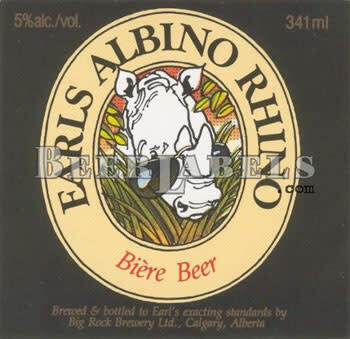 Earls human resources vice-president Mark Barry said in a statement that the chain has used the Albino Rhino name for its house beer for 25 years and refers to the white rhinoceros, not people. "The name was chosen because it was fun and whimsical in sound and denoted something rare and special — we felt proud to have such a beautiful animal, the white rhino, representing our brand," Barry said. "It did not occur to us that the name would be associated with albinism, nor did it occur to us it would offend, and in the 25 years we have been serving our beer we have never had a complaint about the name until now." Earls isn't the only outfit to adopt the Albino Rhino label. It's also the name of a New York creative studio and a Michigan rapper.